The Towing Vessel National Center of Expertise recently published the latest additions and updates to the Frequently Asked Questions regarding Subchapter M, inspected towing vessels. As a convenience for our readers, in this post Maritime Commons is providing a compilation of those changes. Click here to access the full library of FAQs regarding Subchapter M.
On June 27th, Crounse’s vessel the M/V Eva Kelley, was the first vessel in their fleet to receive their Certificate of Inspection (COI). 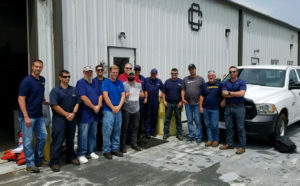 Dylan Hesley, Manager of Safety, along with the shoreside team and the crew of the M/V Eva Kelley worked with MSU Paducah in submitting the required information for the COI application and getting the vessel ready for the inspection. Civilian Marine Inspector Joseph Brown said, “It is definitely a process to gather all of the required information needed for objective evidence but with constant communication between the vessel rep and the Coast Guard it can be relatively painless.” He went on to encourage companies to begin conversations with their local USCG Marine Inspectors and submit their vessel particulars as soon as possible. Submitting these details up front allows the local unit to build the vessel profile in the Coast Guard’s Marine Information for Safety and Law Enforcement (MISLE) system and move on to the step of reviewing objective evidence. Mr. Brown noted that reviewing the objective evidence takes considerable time on their part. TVIB recommends contacting each unit where a company will apply for a COI to determine their specific requirements as the USCG has not adopted a single standard. This was the first COI issued by Marine Safety Unit Paducah. 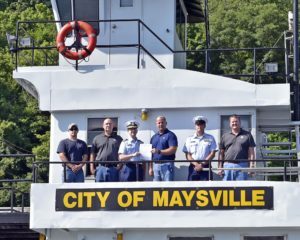 On July 13th, the M/V City of Maysville was the second Crounse vessel to receive a COI. Mike Kidd, Port Captain, worked with the vessel’s crew and MSU Huntington to obtain the vessel’s COI. U.S. Coast Guard Commander Paul Mangini had this to say “The Coast Guard appreciates the dedication, diligence and willingness of the Crounse Corporation to put the effort in to achieve compliance with Subchapter M and supply the necessary information in order to generate the first Certificate of Inspection for the City of Maysville in the Port of Huntington/Tri-State zone. We look forward to continued cooperation as we both work together to bring the rest of their towing vessel fleet into inspected status.” This was the first COI issued by Marine Safety Unit Huntington. The term “uninspected towing vessel” was a misnomer placed on over 6,000 towing vessels as a way to classify them. Uninspected towing vessels, or UTVs, have been the most inspected uninspected vessels out there. This term created a most-unearned negative connotation for the majority of the vessels as many in the inland towing industry have been participating in a third-party audited safety management system under the American Waterways Operators’ Responsible Carrier Program since the early 1990’s. Crounse Corporation is one of those companies. What you’re seeing here is a true partnership between industry and the U.S. Coast Guard working together, to achieve a successful implementation and launch of Subchapter M. Crounse Corporation is clearly on the leading end of Subchapter M compliance. TVIB worked with Robbie Englert, Senior Vice President of Operations, along with a strong shoreside team for Crounse to be the first company to be issued a TSMS Certificate by TVIB. The Crounse team is among our earliest and most ardent supporters. TVIB’s model is one that is shaped by the desire to raise the level of knowledge, understanding, and overall compliance with the programs for which we provide services. TVIB believes that the quality of our auditors and surveyors are the backbone of our organization. Although the phrase “a rising tide lifts all boats” is said to be a reference to economy often attributed to JFK, we believe it is quite fitting for how we think. At TVIB, we believe that when we increase the knowledge and understanding this improves the industry as a whole. We are here to be a solution and to ultimately bring about a safer maritime industry for all. Congratulations to the crews of the M/V Eva Kelly and the M/V City of Maysville and the entire team at Crounse Corporation. Job Well Done! The NI-Gulf Branch Committee is excited to announce its final program for Spring 2018. In an effort to reach out to, and to serve the Gulf Mexico uninspected vessel maritime community, the next technical seminar will focus on Subchapter M.
Register today, and please share this newsletter with the broader maritime community, especially those who will be impacted by Subchapter M.